Students, faculty, and members of the Middletown community convened in the Memorial Chapel on Friday, Jan. 29 for Dr. Dorceta Taylor’s keynote address, “Different Shades of Green, or Beyond the Farm.” Taylor, who is a professor at the University of Michigan as well as James E. Crowfood Collegiate Chair, Director of Diversity, Equity, and Inclusion, and past Chair of the Environment and Technology Section of the American Sociological Association, spoke in honor of Martin Luther King, Jr. commemoration week, and her speech served as the final segment of a four-part event series focused on environmental justice. The event was sponsored by the University’s Green Fund, members of the Student of Color community, the Office of Equity and Inclusion, the Office of Student Activities & Leadership Development, the Office of Residential Life, the Center for African American Studies, the Office of Academic Affairs, and the Allbritton Center for the Study of Public Life. The ceremony opened with a welcome from University President Michael Roth. He prefaced the lecture by acknowledging the persisting structural injustice, racism, and environmental degradation in the modern world and the urgency of addressing these problems. Tedra James ’18 then took the podium to provide an overview of the issues to be discussed and how they commemorate the legacy of Dr. King. An audio clip of Dr. King’s baccalaureate address at the University in 1964 followed to evoke the core values of his legacy. After a moving performance of “Lift Every Voice and Sing” by Associate Director of Career Development and Campus Outreach Persephone Hall, honoring historical community of color movements, James welcomed Taylor to the stand. 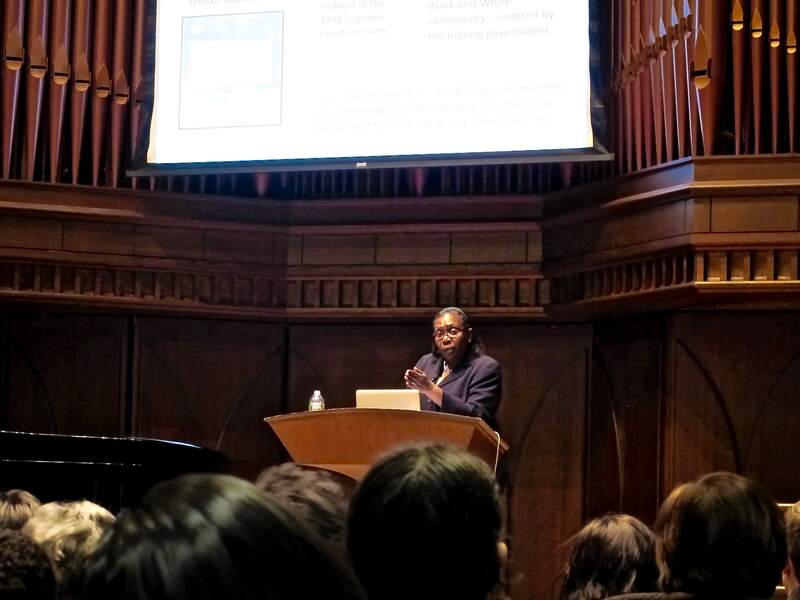 Taylor began her lecture historically, describing how certain racial inequities got their roots, specifically the way in which black and brown individuals came to be discriminated against with respect to their location and environs. “One of the things that we consistently see in history if we look at environmentalism and environmental justice is the idea of controlling the spaces where people of color live, work, and play,” Taylor said. Taylor explained the way that in post-slavery society, people of color were systematically displaced, leaving them a demographic divided. This type of location-based racism occurred at the hands of urban planners who succeeded in building freeways and other structures that created physical barriers between and within such communities. Taylor described how difficult it was for vibrant neighborhoods of color to exist under these conditions and how this issue is prevalent even today. She then shifted the discourse to talk about how the same logic applies to the American food system in its unfair treatment of black and brown individuals. Though Taylor began by presenting the disadvantages and injustices that face the modern community of color, she closed off her speech by mentioning some efforts in progress aiming to mitigate this type of location-based discrimination as it concerns the food system. She cited Detroit as being one of the most eminent examples of a city attempting to erase its perceived “food desert” stereotype by addressing the issue of food insecurity. She mentioned the case of UpSouth Foods, a food truck that transports crops from the South up to the Detroit area and how the business is redefining what it means for produce to be considered local. Not only does such an endeavor make healthy foods more accessible to Detroiters, Taylor explained, but it also helps out black farmers financially by bringing their crops to market. After a round of applause, Cassia Patel ’17 took the podium to highlight the importance of the issues presented in Taylor’s talk. She added that although being an environmentalist is not necessarily indicative of race or ethnicity, this specific community of activists tends to be lacking in diversity. During the question and answer session, Taylor fielded questions about the ongoing water crisis in Flint, Mich., as well as questions on what local initiatives can be taken in regards to soil quality in Middletown gardens. Sustainability Director Jen Kleindienst reacted to the sometimes ignored but pertinent interdisciplinary nature of environmentalism and its relation to social equity and inclusion. Kleindienst hopes the conversation that Taylor started will continue to inspire the community in ways different than ever before. Genna Mastellone ’17, an active member of WesDivest, also gave her input regarding the lecture. The event also followed a discussion earlier that day among Taylor, members of the student of color community, and members of sustainability initiatives on campus. The discussion aimed at talking about efforts to further increase the connections between student of color efforts and sustainability efforts.